Eternal Life Can you believe that the oldest company in the world Kongō_Gumi is 1500 years old! Like profit organizations, nonprofit organizations are granted eternal lives. They remain relevant long after their founders are gone. Government Grants If you are dedicated to the cause, your organization gets government grants, governments grants are a pat on your back for your efforts in the field plus they are an extra source of money specifically for the cause your organization is working for. Before getting a grant, one needs enough money to run the organization. Once you get approved for getting a grant, you need to report back to the funder on how you used the money given to you as a grant for your cause. Getting approved for a grant requires time and effort. Employee Benefits Employees of nonprofit charity organizations get various benefits; they may qualify for group life insurances and discounts on health checkups. Employees feel satisfied by doing philanthropy work. Public and Private Incentive Donations which come from corporations and individuals are tax deductible, thereby encouraging people to contribute. Formal Structure Creating a formal structure with specific job descriptions can attract potential skillful employees to contribute to the productivity of the nonprofit organization. As we know nonprofit organizations need funding to operate, without donations they will not be able to afloat. 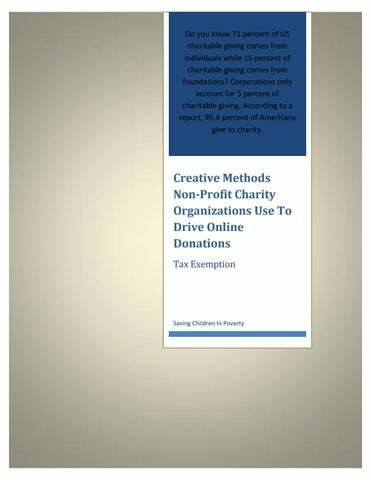 Here, we will discuss Creative Methods Non-profit charity organizations use to drive online donations and the last method helped Bernie Sanders to raise $10 million. Online Fundraising With the advancement in technology, nonprofit organizations create their own websites; users can directly come to the site and can add the amount they wish to give to the charity in the comfort of their homes. Do you know first â&#x20AC;&#x153;Donate Nowâ&#x20AC;? button was released in the year 1999? Charities which do not have enough budgets to arrange for a physical campaign can create their online campaign and can promote it on various social media sites to get more coverage. Online campaigns play a major role in making any fundraising event successful. According to a report, nonprofit organizations raise 7.6 percent of their total revenue online. This number is enough to point out that online fundraising is vital to increase the revenue of a nonprofit. It should be noted that 30 percent of all the online giving occurs in December. It is also beneficial to have a mobile app for your website as 21 percent of online donations are made through a mobile phone. Crowdfunding In simple terms crowdfunding is raising money from the public. Crowdfunding helps people to align with your cause. Gofundme is the number 1 platform which helps raise money for organizations as well as individuals in need. Other platforms which do crowdfunding for nonprofit organizations are You Caring, Razor, Fundraiser, Crowd Rise, First Giving, etc. Crowdfunding is important to make your voice reach to a higher number of people. As crowdfunding is an online process, people from other nations can connect with your cause. According to a report, 45 percent of donors donate to the nonprofit organizations located outside their country of residence, it is so important to connect to these potential donors through crowdfunding and promoting crowdfunding campaign at various social platforms. Peer To Peer Fundraising Peer to peer fundraising helps in raising more money in less time. It is also known as social or team fundraising. You can encourage your peers to set up personal fundraising websites on your behalf. Your peers can divide the amount that needs to be raised and can contribute a particular amount through their own network. Isnâ&#x20AC;&#x2122;t it astounding that out of the 4 emails sent through peer to peer fundraising, 1 results in donation! Incentives Incentives play a major role in achieving donation goals. For example, some websites offer a mug or a t-shirt for donations $100 and above. Giving something in return to your donors, even if it is a small gesture goes a long way in getting new donors. Amazon Smile Amazon is the biggest online retailer. Amazon Smile has the same products and prices as Amazon; the only difference is that the Amazon Smile foundation donates 0.5 percent of the purchase price to your favorite nonprofit organization. 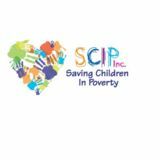 You can ask your friends, relatives, and your peers to shop through the site and support your organization.